Both Phones comes with the metal body, Fingerprint scanner and support for MicroSD card slot. 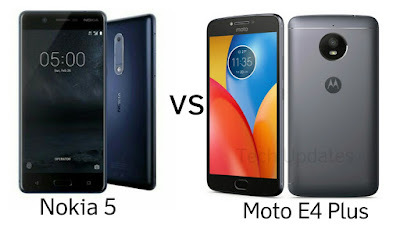 Nokia5 has a 5.2-inch (1280 x 720 pixels) 2.5D curved glass display with Corning Gorilla Glass 3 protection compared to 5.5-inch (1280 x 720 pixels) HD 2.5D curved glass display on Moto E4 Plus. Nokia 5 is powered by 1.4 GHz Octa-core Qualcomm Snapdragon 430 processor whereas Moto E4 Plus comes in two variants Quad-Core Snapdragon 427 processor with / 1.3 GHz Quad-core MediaTek MT6737 processor. On Camera Both Phones has a 3MP Rear camera with LED Flash, Nokia 5 comes with 8MP front camera whereas E4 Plus has 5MP front facing camera. Both Phones runs on Android 7.1.1 Nougat which is Stock Android Nokia 5 will be getting Android O Update, No Details if Moto E4 Plus will be getting next Android Update. Both Supports 4G VoLTE. Nokia 5 is packed with a 3000mAh Battery compared to 5000mAh Battery on Moto E4 Plus. Nokia 5 is priced at Rs 12,899 in India whereas Moto E4 Plus comes in Iron Gray Fine Gold color priced at $179 in the US expected to be priced at Rs 9,999 in India will be Flipkart exclusive. Nokia 3 has Octa Core processor and will get Software Updates for next 2 years whereas E4 Plus comes with Bigger Display and Battery.